Well Preserved: A Jam-Making Hymnal by Joan Hassol is a tribute to the joys of preserving the seasons in your kitchen. Part memoir, mostly recipes, this book was enjoyable to read through and imagine what kind of jam I might like to make next. Hassol's drive to make jam so matches my feelings that I felt I was reading my thoughts put on paper. Here are a few excerpts from the introduction: "There is something about finding the succulent, almost ripe fruits; about picking berries; about laboring in the hot sun, that awakens long-dormant memories of a sun-washed early childhood....I'm still a hunter-gatherer, with an instinctive sense of needing to 'have enough'...Stacking jars fills me with a sense of security....This book is about my relationship with jam, my soul, music, and the world in which I live." Arranged seasonally, you will find recipes such as: Apple Grape Jam, Cranberry Raspberry Jam, Green Tomato Chutney, Cranberry Citrus Chutney, Lemon Ginger Marmalade, Orange Marmalade with Whiskey, Strawberry Rhubarb Jam, Rhubarb with Ginger Jam, Apricot with Rum Jam, Pineapple Ginger Jam, Blueberry Jam, Raspberry Amaretto Jam, Cherry Pineapple Jam, and Wild Cherry Jam. The book ends with a collection of muffins, breads and scones to enjoy with your jam. 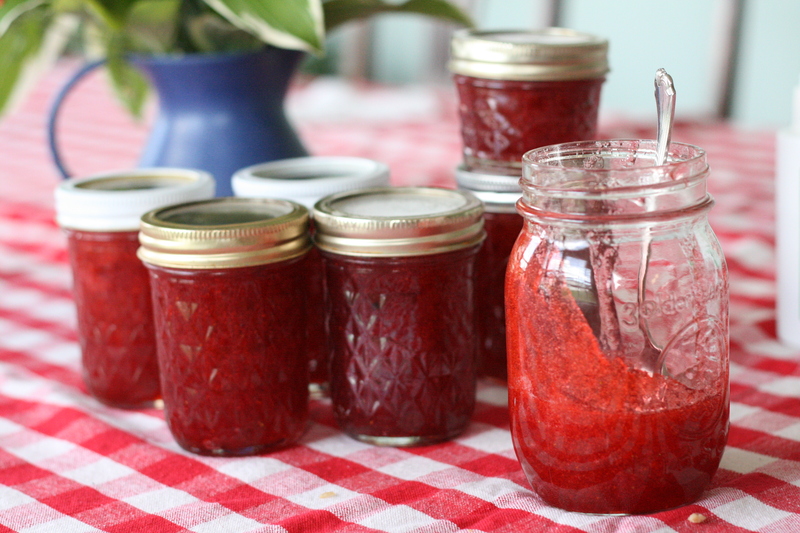 I decided first upon the Strawberry Rhubarb Jam since I love that kind of pie. The directions were easy to follow and my jam came out exactly as it should. The original recipe did not include a processing time so I just checked with the National Center for Home Food Preservation and found I should process my jam for 10 minutes. I could have wished for more fruit flavor, and less sweet, but with the amount of sugar in these recipes, one won't be getting something less sweet. I would really like to try the Rhubarb Ginger Jam next! Simmer the strawberries, rhubarb and water until the rhubarb is soft, about 5 minutes. Bring to a boil. Add the pectin. Return to the boil. Add the sugar slowly, stirring constantly. Bring to the boil again and boil for 1 minute, or until the jam sheets off the spoon. Pour into hot, sterilized jars. Cover with new, clean, hot lids. Process in a hot water bath for 10 minutes. I don't think I've ever had rhubarb and strawberry together, but they sound lovely!